Did you know there is a tropical island in Chandler, Arizona? 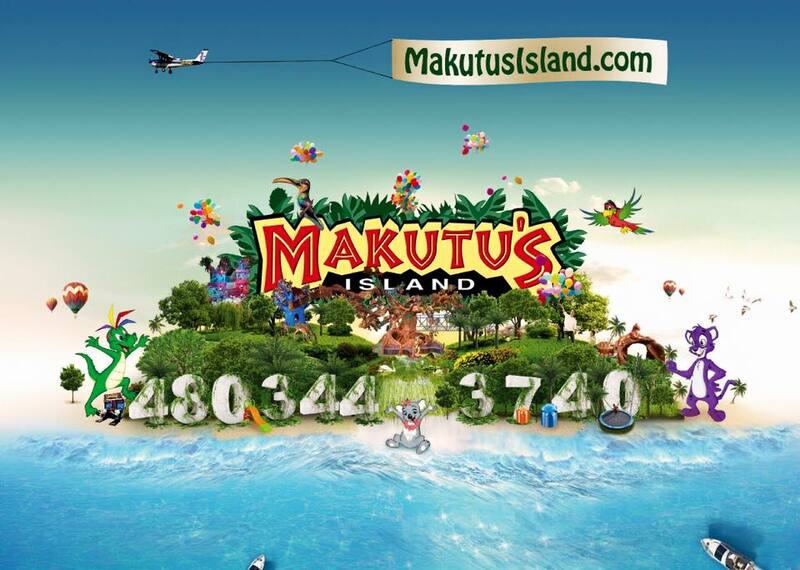 As a matter of fact, Makutu’s Island is an indoor play center with a comfortable climate. This colorful indoor island has a charming tropical theme, ideal for imaginative children and their parents. At the heart of Makutu’s Island children will find one gigantic banana tree. The magnificent tree is full of new things to explore. Children may scramble through tunnels and caves in the midst of the giant tree. Makutu’s Island’s best slide is known as the Snake Slide, which wraps completely around the tree several times. This magical island even has a mini zip line and swaying rope bridge to cross imaginary valleys and ravines. Let’s not forget Captain Max’s thrilling bungee ride. Captain Max’s Bungee Jump is a safe bungee ride designed just for kids. Makutu’s Island also has an active volcano. Located near this bubbling lava is Inferno Arcade. Inside the arcade gamers of all age can play to their hearts content. A visit to the Jungle Jamboree Theatre is full storytelling, crafts and educational activities. For the younger island visitors, Oscar’s Lagoon is the perfect play area. This toddle zone allows young children to play and explore at their own pace. There are multiple miniature slides and many soft building blocks to play with. Kiki’s Cafe’ is always ready to feed a hungry crew. Kiki has a full menu with many classic favorites of every family. The menu consist of fries, salads, quesadillas, mac n cheese, yogurt, and specialty pizzas. Makutu’s Island has a special place for parents to relax and recharge. The parents lounge offers free WiFi, comfy seating, and a charging station. Makutu’s Island is also very accommodating to children’s birthday parties. There birthday packages include drinks, goodie bags, all-day play time, arcade tokens and yummy food. Socks must be worn at all times and guest must fill out a waiver before they may explore the island. Hi, I'm Chris and I'm a resident if Scottsdale, AZ and I've lived in Arizona nearly all of my life. I'm exploring the state with my wife and daughter and sharing our favorite things to do in Arizona.